Adrian Steel releases a full line of interior shelving and modules, ladder racks, partitions and accessories for the new Nissan NV200. 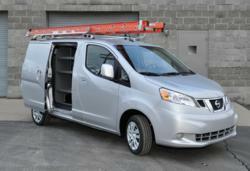 The new Nissan NV200, upfitted with Adrian Steel products. Create a custom interior or start with a pre-designed package. With the introduction of the new NV200 Compact Cargo Van by Nissan, Adrian Steel has released a full line of interior shelving and modules, ladder racks, partitions and accessories designed specifically for the NV200. Whether you are looking for climate control or maximum visibility, Adrian Steel has two bulkhead options for the NV200. The Full Steel Partition offers the best in climate control and noise reduction, while the Full Wire Partition offers maximum visibility. The interior shelving packages for the NV200 feature adjustable shelving in a variety of combinations to suit different needs. Shelving can be upgraded with drawer units, accessory hooks, dividers, door kits and other trade specific accessories. Create a custom interior or start with a pre-designed package and modify to fit specific business requirements. Adrian Steel offers two roof rack options for the NV200. Carry up to two step or extension ladders with the all-aluminum Double Grip-Lock ladder rack. For more versatility - carry ladders, conduit, sheet goods and more with an all-aluminum Utility Rack. Both racks feature no-drill installation, and the crossbars of the Utility Rack can be easily repositioned along the innovative rail system. Get the most out of the new NV200. Ask a Nissan dealer about incentive offers available with the purchase of a new NV200 Compact Cargo Van. Qualifying customers can receive Adrian Steel upfit packages at reduced costs. See the full line of NV200 equipment on Adrian Steel’s website at http://www.adriansteel.com. Request a catalog and search for a local Adrian Steel distributor. Adrian Steel is committed to its clients beyond the upfit! A dedicated Customer Care Team is available at corporate headquarters Monday through Friday 8:00AM-5:00PM EST, and a network of authorized distributors is there to support customers locally. Call Adrian Steel at 1-800-677-2726 or email at info(at)adriansteel(dot)com with questions, comments, and feedback. From its beginning in 1953 as a small structural steel warehouse with four employees, the Adrian Steel Company has grown to become a leader in the van and truck equipment industry. Located in Adrian, Michigan, the manufacturing facility now encompasses 166,900 square feet with over 300 employees. Adrian Steel is committed to providing quality products highlighted by constant innovation. Adrian Steel's attention to detail and customers is thorough; it began through the corporate values instilled by founder Bob Westfall, University of Michigan All-American and Detroit Lion All-Pro football standout. Those values instilled a team effort to provide customers with value-added products and services that have become the standard of the industry.